Some love it, some hate it, but for the Spanish a Madrid Bullfight is the pinacle of one of Spains greatest traditions! 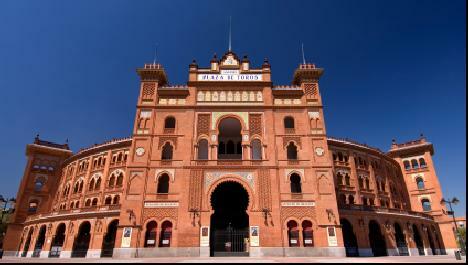 Some say a visit to Madrid is not complete without at least visiting the famous Madrid Plaza de Toros! and daily during the Fiesta San Isidro. In the east of the central district and located on one of Madrids main thoroughfares, Calle Alcala, the Madrid bullring is served by its own Metro station Ventas, regular bus services and is only a 5€ taxi ride from downtown Madrid. The Madrid transport authority puts on additional services throughout the fight calender although having 23,000 people leaving an event centre at the same time can mean these are close to full and you may have to wait a while. This is also true when the bullring is being used for concerts of shows such as the motorcross (at madrid bullfight ring) in September of every year. Tickets for a Madrid bullfight can still be purchased on the day between 1000 - 1900 from the ticket booths "Taquillas" located at the plaza, although these may sell out in advance if a famous Torero is performing. The Taquillas are also open on the Friday and Saturday before the fight, 1000-1400 & 1700-2000, however this depends on the numbers still available. There are now a number of companies allowing internet purchase of tickets in advance and whilst guaranteeing your ticket this does come with a small premium. For a far greater premium you can also buy tickets in front of the bullring from one of the many touts that congregate there before each fight. Madrid Bullfight Ticket prices range from as little as 3€ to over €100 depending on where you sit in the bullring, who is performing and whether you want a ticket in the sun (sol) or shade (sombra). Residents Tip: If buying from a tout thoroughly inspect the tickets to make sure they are together and do not believe him telling you the event is sold out unless you already know it to be true! Touts are continuously saying Madrid bullfights are sold out! A Madrid bullfight consists of six bulls & three matadorswith each matador being accompanied by two assistants. In a little over two hours the matadors will each kill two bulls or "toros" as they are known in Spain. To start the spectacle the matadors and their assistants will enter the bullring and parade in front of the crowd in order of stature. The 1st matador will be he of the longest time served as a matador unless it is the 1st time in Madrid for one of the matadors in which instance he will lead. The matadors and their assistants will go to their respective areas behind the Madrid bullring safety boards and await the 1st bull. Prior to the bull being released the equivalent of the master of ceremonies will annoce the bull via a handcaried billboard giving details of the farmer, origin and bulls weight. With the pomp and ceromony over the bull is released! 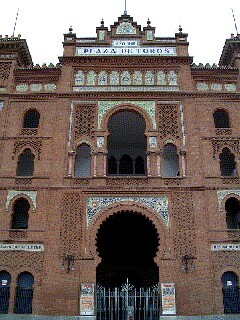 Initially the two assistants will enter the bullring and goad the bull into making a number of passes. This is done to determine the health and agression of the bull whilst the matador watches on. Sometimes the bull will not respond and the crowd will start to whistle. If this happens the bull will be returned and a replacement bought out. Having secured a suitable bull the band located in the upper reaches of the plaza will play a quick melody signifying the entrance of two horses and their riders. The purpose of the riders is to manouver themselves so that they can make short cuts with their lances into the shoulder area of the bull. This serves to agitate the bull and to start the blood flowing out of the animal. A further melody signifies when the appropriate time has passed. With the now enraged bull the assistants return to the bullring carring short barbed staffs banderillas. The assistants will attempt to have the bull charge them and at the last minute, going over the horns, plant the barbs into the bulls shoulders. A good assistant will plant the barbs firmly and accurately and the crowd will applaud this. Again a short melody signifies the end of this process. 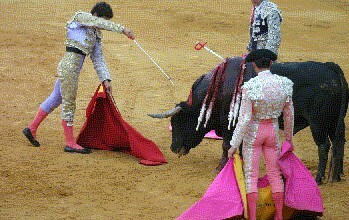 Now it is the turn of the matador which translated literally means "killer". Using his cape the matador will have the bull charge him. 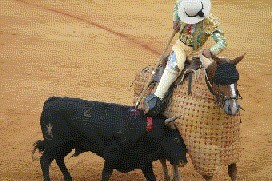 The objective being that when the bull does so the matador maintains a rigid pose and guides the bull around his body. Skilled matadors will do so in a way that the cape does not leave the ground. As the bull tires, both through blood loss and exertion, the band plays up again and the matador goes to his assistant for the killing sword. On a particular charge this will be driven over the horns, through the shoulder blades and directly into the animals aorta killing it dead. This however doesn´t always happen and it may be necessary for the assistants to finish the stricken bull with a sharp needle like dagger between the eyes. Following the removal of the animals carcass, to be butchered and sold to high class restaurants, the next fight will be announced! The spectacle will continue until each Matador (or in the event of injury, his substitue) has killed the allocated two bulls. Should one matador have achieved four ears he will be hoisted above the other two and leave through the puerta grande "great door". So ends the typical Madrid bullfight experience in the plaza de toros! Bullfighting perhaps a little too much? Try one of Madrids other Sports!